Here’s another one for the “Why didn’t I think of this” archives. 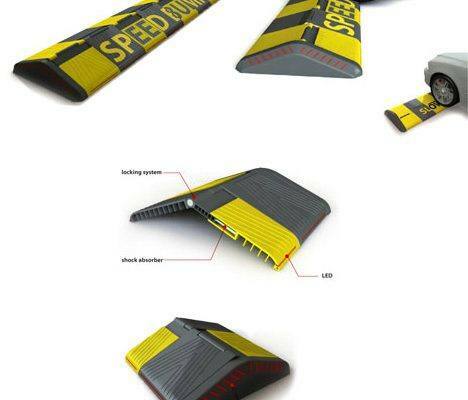 Designers Jae-yun Kim and Jong-Su Lee have developed a much smarter speed bump; one that consists of retractors that open if the impact with them is small enough, flattening the bump, while staying open for those traveling faster than about 19 mph. This of course would also help in keeping your suspension in better shape, and they also hope to “reduce the amount of stops and starts made, and thus, the amount of exhaust waste from the car.” How nice. I would imaging that these smart speed bumps would be much more expensive than your regular slab of concrete and yellow paint, so I wouldn’t expect to see these in every parking lot and residential area any time soon. 1 Comment on "Smart Speed Bumps Flatten for Slow Drivers"
now that's something every country should use for their roads. I hate each bump that i have to pass.